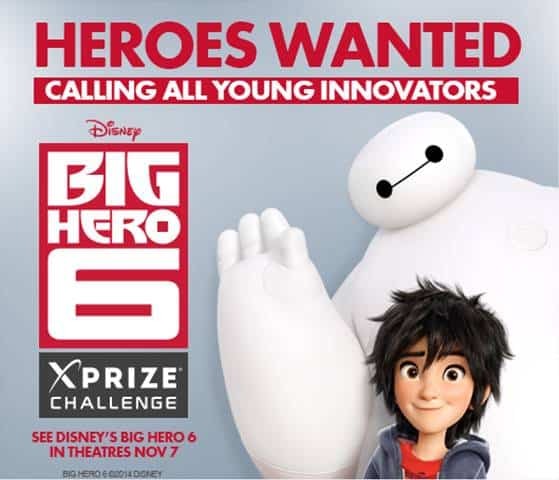 XPRIZE just launched a contest exclusively for 8-17 year-olds to create a real-life Big Hero 6! Six winners will win a trip to Los Angeles, California to walk the Red Carpet at the Hollywood premiere of Disney's Big Hero 6. They'll also have the opportunity to go behind-the-scenes at Walt Disney Animation Studios! The video submissions may involve a short story, sculpture, drawing, model, robot or whatever method best communicates the idea in the most creative way (please see Official Rules for further details, restrictions and limitations). They will be scored on how well they explain the problem, show their solution, and explain what they learned and the impact their idea would have on themselves and the world. The more creative and engaging their presentation is, the better their chance of winning. Be sure to watch the official Big Hero 6 trailer and read my announcement about the Big Hero 6 voice cast! With all the heart and humor audiences expect from Walt Disney Animation Studios, Big Hero 6 is an action-packed comedy-adventure about robotics prodigy Hiro Hamada, who learns to harness his genius—thanks to his brilliant brother Tadashi and their like-minded friends: adrenaline junkie Go Go Tamago, neatnik Wasabi, chemistry whiz Honey Lemon and fanboy Fred. Inspired by the Marvel comics of the same name, and featuring comic-book style action, “Big Hero 6” is directed by Don Hall (Winnie the Pooh) and Chris Williams (Bolt), and produced by Roy Conli (Tangled). The film hits theaters in 3D on November 7, 2014.